Buy Your Meditation Knee Cushion Now and Meditate in Style and Comfort! MEDITATION IN COMFORT - Design meets nature in this comfortable floor sitting cushion with ergonomic shape. Soft and flexible, Yoga Habits Kit meditation cushion equally distributes the weight, reducing strain on your coccyx and ensuring optimal comfort and balance. BUILT TO LAST - If you value durable, sturdy floor sitting pillows, Yoga Habits Kit Crescent Zafu Cushion is perfect for you! Thanks to its strong stitching, robust handle, and cotton filling, this yoga meditation cushion will keep you company for a long, long time. BUG-FREE EXPERIENCE - Unlike sitting cushions with buckwheat hulls, this meditation zafu is entirely insect-free and hygienic. Made exclusively of natural cotton, the meditation pillow is suitable even for persons with allergies. 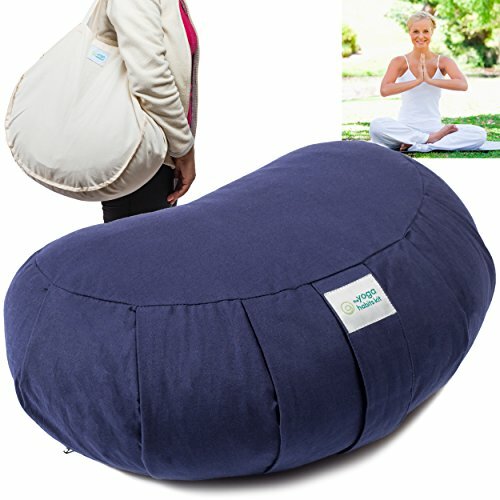 FREE YOGA BAG - When you buy your meditation bolster today, you will also receive a cotton yoga bag. Use it to comfortably carry your yoga pillow and other yoga essentials to the studio or outdoors! SATISFACTION GUARANTEE - Yoga Habits Kit Sitting or Meditation Cushion is made exclusively from organic cotton, to ensure the best meditating experience. In the unlikely case that our meditation floor pillow won't help you relax, just send it back for a full refund! If you have any questions about this product by Yoga Habits Kit, contact us by completing and submitting the form below. If you are looking for a specif part number, please include it with your message.